Ericsson is one of the top three wireless network equipment companies in the world (they were #1 until Huawei took that coveted spot). Approximately 40% of the world’s mobile traffic is carried over Ericsson networks. The company has customers in 182 countries and offers comprehensive industry solutions ranging from Cloud services and Mobile Broadband to Network Design and Optimization. Ericcson also has one of the most compelling IoT platforms in their IoT Accelerator, which we described earlier this year. Ericsson had a huge presence at IoT World 2018 with an impressive exhibit floor booth, a Wednesday private briefing session at their Santa Clara, CA location and three presentations at IoT World 2018 conference sessions. I attended the private briefing at Ericsson- Santa Clara, got a tour of some of the exhibits there, heard the talk by Shannon Lucas (VP. Head of Emerging Business Unit in North America) on Tuesday and met with Ericsson’s IoT expert Mats Alendal on Thursday for a one on one conversation about Ericsson’s IoT strategy and associated wireless WANs (e.g. NB-IoT, LTE-M, and “5G”). Most surprising was that Mats claimed that the transition from 4G LTE to whatever the 5G RAN/RIT is will be ONLY A SOFTWARE UPGRADE OF ERICSSON’S BASE STATION. 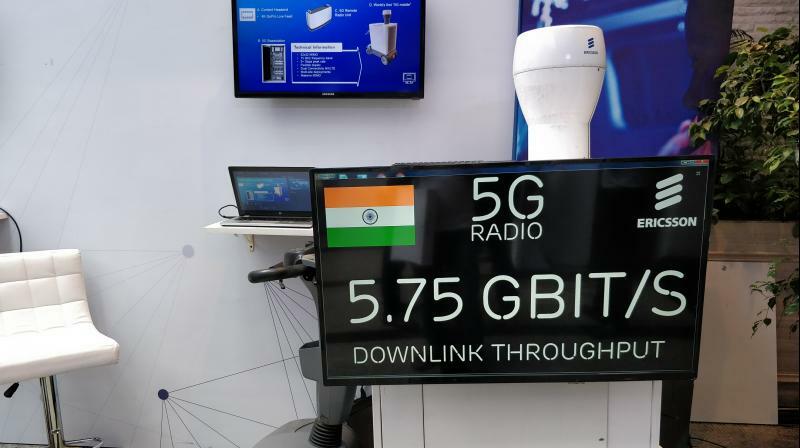 He also said that if the 5G latency could be reduced to 1 or 2 ms, it would open up many new real time Industrial IoT (IIoT) applications that we haven’t thought of yet. Such a low latency would require a controlled environment, typically in a manufacturing plant or similar, and mm wave radio. Currently most IIoT applications rely on wired connectivity on a factory floor, manufacturing plant or test facility. In a few cases wireless LANs (e.g. WiFi, Zigbee, proprietary) might be used. Hence, wireless WAN connectivity represents a big shift for many industrial customers. IIoT use cases in manufacturing require a wireless WAN with low latency, guaranteed delivery of messages/packets/frames, and instant control/feedback. One of the best IIoT wireless WAN solutions is Private LTE. It’s probably more robust than cellular LPWANs (NB-IoT and LTE-M) and provides cost benefits as well. In a Thursday afternoon session, Nokia recommended Private LTE for many of those IIoT applications (more information by emailing this author). Ericsson is delivering Private LTE equipment via its 3GPP compliant, licensed and unlicensed bands for Private LTE. IIoT use cases powered by Ericsson include connected factory robots, manufacture of highly precise bladed disks (BLISKs) for turbines, and spherical roller bearings for SKF. A case study for 5G trial for BLISKs may be viewed here. Hardware innovation platform can make LTE-M and NB-IoT easier to implement for network operators. AT&T and Verizon are using Ericsson’s NB-IoT technology for their commercial offerings. Ericsson has driven standards for cellular connectivity, and that effort is now naturally extending into setting standards for IoT, and more specifically, cellular IoT. With standardization, the IoT becomes a platform from which collaboration between organizations, both private and public, will benefit us all. Ericsson’s standardized approach for connecting devices and sensors allows cities to collaborate and share data, regardless of legacy platforms. This helps engineers improve traffic flow, and allows emergency services to optimize response times. A collaboration between Ericsson, Intelight and Teleste is helping to break up traffic and information gridlock. Four cities in the Dallas-Fort Worth metroplex have launched a regional system employing the Ericsson Connected Urban Transport ITS platform. Ericsson Ventures (VC arm of Ericsson) is focused on driving innovation in areas that will accelerate Ericsson’s core business and generate strong financial performance. Intent is to combine start-up solution with Ericsson’s technologies. 6 to 7 deals per year with average investment of $1.5M. Ericsson likes to be part of a syndicate of VCs and corporate investors in the targeted start-up. They are start-up stage agnostic. Areas for Ericsson Ventures investment include: IoT, analytics connected car, security, SDN, AR and VR, mobile advertising, wireless connectivity AI and ML. Many new IoT applications will be enabled by 5G (so thinks everyone), including the connected car and real time control for IIoT. This author is not so sure. We think that high bandwidth and/or low latency might be needed for at most 5 to 10% of IoT applications. Global 5G subscriptions will reach 1 billion by the end of 2023, with 5G covering more than 20% of the global population, Ericsson has predicted. Ericsson’s latest Mobility Report predicts that the first 5G new radio deployments will go live in 2019, with major deployments from 2020. Early 5G deployments are expects in markets including South Korea, Japan, China and the US. LTE will meanwhile become the dominant mobile access technology by the end of this year. But after reaching a peak in 2021, subscriptions are expected to drop off slightly as they are supplanted by 5G. Global LTE subscribers are tipped to reach an estimated 5.5 billion subscriptions by the end of 2023, with a global LTE population coverage of 85%. VoLTE subscriptions are also expected to reach 5.5 billion by end-2023, accounting for more than 80% of combined LTE and 5G subscriptions. The report also projects that global mobile data traffic will pass 100 exabytes per month in 2023, the equivalent of 5.5 million years of HD video streaming. “The latest report highlights trends in mobile subscription and data traffic growth, as well as the industry’s effort to tackle the increasing demands on mobile networks globally,” Ericsson chief strategy officer and head of technology and emerging business Niklas Heuveldop said.